Starting Saturday, June 28th, Camelot Theatres in Palm Springs will begin a new “Dinner and a Movie” Film Series – bringing some of the biggest blockbuster movies ever to hit the Big Screen back to the BIG Screen! 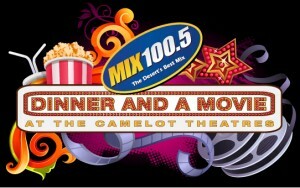 Camelot Theatres, which has the widest movie screen in the desert, will begin the revival screenings every Saturday evening at 9:30pm, but wants movie-goers to know that they can start their evenings early with dinner and/or a cocktail at the Camelot Internationale Cafe and Bar. The Camelot “Dinner and a Movie” Film Series, which is presented by MIX 100.5 FM and RR Broadcasting, will open with the 1975 thriller JAWS, starring Roy Scheider, Richard Dreyfuss and Robert Shaw. Directed by Steven Spielberg and based on Peter Benchley’s novel of the same name, JAWS is widely regarded as the prototype of the Summer Blockbuster genre of films. It became the highest-grossing film in history at the time, and it was the most successful motion picture of all time until the release two years later of Star Wars. Other films in the series include Caddieshack, Tootsie, The Breakfast Club, The Princess Bride, Top Gun, Raiders of the Lost Ark, Dirty Dancing, and more. Movie Tickets are only $ 6.50 each.